Martijn Koch > work > M+ M- ??? Redesignme.com is a website where designers are challenged to create new designs for certain products. 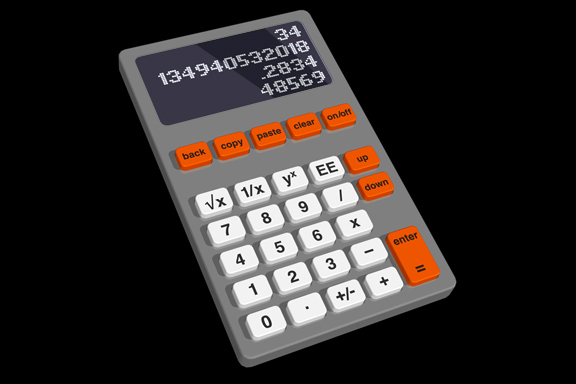 Garton Jones used redesignme.com to search for a redesign of the Ativa 10 Digit Desk Calculator. I'm always puzzled by the fact most calculators still function like the early 1970 designs. A time when chip logic was very expensive, and the amount of components was kept to a minimum. Today's standard micro controller is way more powerful. So my primary goal was to create a new set of basic functionality. Which means I had to redesign the layout of the buttons first. The design itself continues proved ingredients like injection mould plastic, the perfect shape of PTT's Zurich telephone and modern white OLED matrix displays. My own challenge was to make the design in one hour on a Friday afternoon. The result: a top 3 note among 109 redesigns. "Your redesign was part of my top 3. Very well done! Yours sincerely, Charlie Garton-Jones"